Some years ago I heard about Steve Watson, the Tree Shepherd, who was planting trees in the hills of Snowdonia on land grazed by sheep. I phoned him up and he told me about the tree planting, as well as his work building osprey nests, and their success in attracting breeding birds. It was in one of his nests at Glaslyn near Harlech that ospreys raised young in the year 2002, the first in Wales since they were exterminated in the nineteenth century. Steve had established nests in several locations in North Wales and was interested in carrying out this work around the Dyfi estuary. Eventually I got to meet Steve when we put up a nest together on a hill overlooking the Dyfi. It is the nest where ‘Blue 24’ has laid eggs for several years in a row, having mated with ‘Monty’, paired with ‘Glesni’, who are famous from being featured on the telly programme Springwatch. Being without her own partner, Blue 24 has not been able to raise chicks. No doubt her fortunes will change as the number of ospreys increases. Back to the trees…. 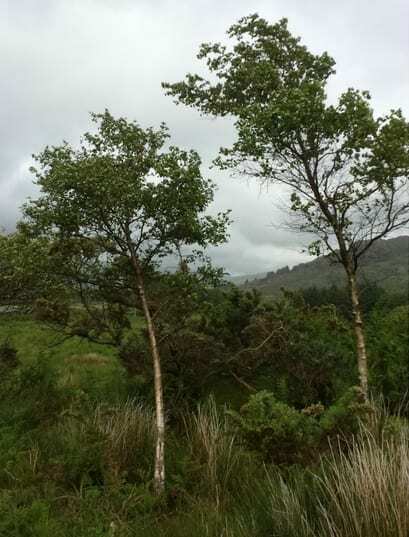 It was a cold, windy day last June when I spent an inspirational day touring Snowdonia, where Steve showed me a selection of his tree planting sites. 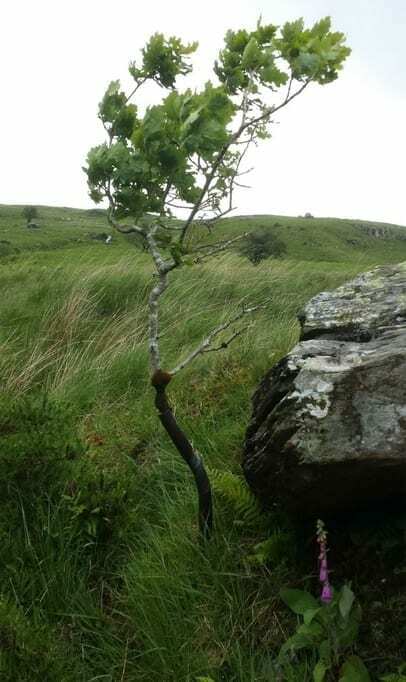 I imagined that we would be going out to see the occasional tree struggling to grow on inaccessible crags. The reality is very different and quite awe-inspiring. 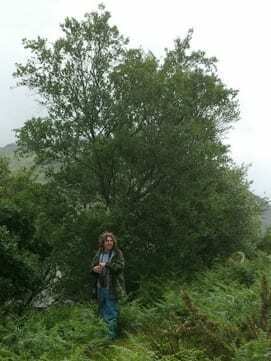 Steve showed me vast areas of hillsides covered in young native woodland, aged up to about 30 years old. We visited half a dozen sites like this, and I was told that there are many more: it would take several days to visit them all. 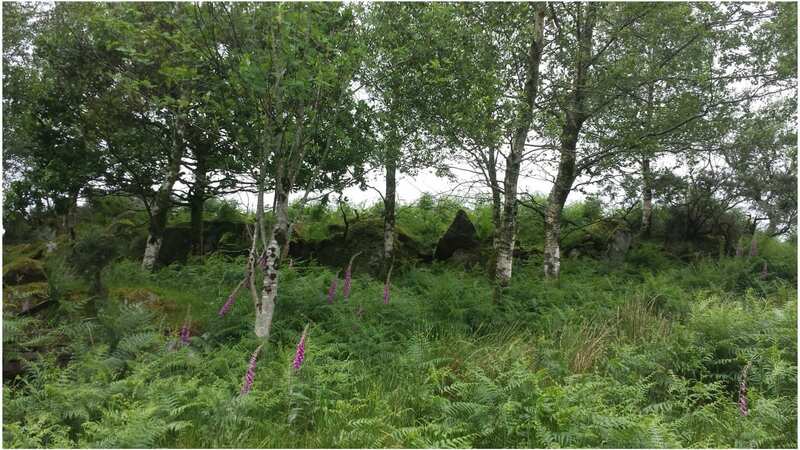 It is a remarkable achievement by any measure, and more so as these woodlands were all established in the presence of continued sheep grazing on the land. Steve has spent over 30 years collecting tree seed, growing the trees in his nursery, and spending winter months out in the hills planting the trees. All of this at no cost to the landowner, and no need to stop grazing. Steve’s work was entirely voluntary and many thousands of trees were grown and given for free to landowners and the nation. He started the project in 1981 and it wasn’t until 1997 that limited funding became available, with more substantial funding in 2000. He used the funds to expand production and to employ others to assist with the project, while he continued as a volunteer for the most part. Tree planting in the presence of sheep grazing is contrary to accepted theory and practice, for the reason that sheep like to eat trees. They will eat any tree shoots within their reach, so young trees will be entirely consumed and have no hope of survival. So how does the Tree Shepherd do it? The answer lies in the method known as ‘sabre’ tree planting. The trees are grown in the nursery until they reach at least 4 foot (1.2 metres) in height. Generally they are ‘cell-grown’ in 1 litre containers to make sure the roots are compact and have some good soil around them. During planting time, the trees are carried out onto the hillside, and the planting site for each tree is carefully chosen. This is the crucial bit, and demands a good level of sensitivity to the landscape and how the grazing animals behave. A classic good planting position will be on a section of steep slope. This could be a long and high landscape feature such as a cliff, but more often it is a small section of hill with a steep section only about 3 foot high. The tree is planted perpendicular to the hillside so that the lead shoot is out of reach of the livestock. As the tree grows upwards, it will start to take on a more vertical direction, creating a curve in the stem. The curve is what gives the name ‘sabre’. As the trees get older, the sabre form becomes less noticeable. I saw woodlands about 20 years old where some of the trees were visibly curved, but most appeared to be completely straight even though they had started out as sabres. 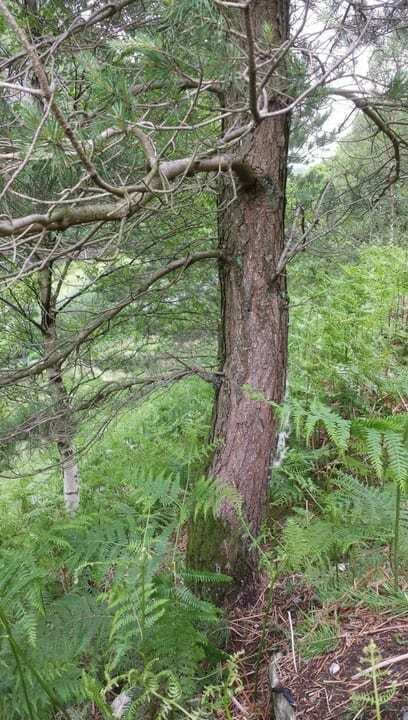 A similar strategy, known as ‘protective clover planting’, is to plant the trees in the edge of gorse bushes, or in other vegetation such as bracken or bramble, or even Japanese knotweed. As the trees grow, they shade out most of the gorse or bracken, creating extra pasture as well as shelter for the animals. The trick is in observing what is in the landscape and making use of the features, keeping in mind how livestock behaves and how the trees will grow. Another method coming under the general heading of ‘no fence planting’ is to use tall, well-established trees. 9 foot willow cuttings can be collected in the wild and stuck deep into the ground, being stabilised in the soil by making use of a fork in the growth of the tree cutting. Similarly, an option is to use tall ‘standard’ trees, where the leading shoot is out of reach of the grazing animals. These need to spend longer growing in a nursery and so will be more expensive if being purchased. With these last two, trees can be established on flat, open ground in the presence of livestock. The different methods can be used in combination on sites. No fence planting is very simple as a concept, but in the field there are many, often subtle, differences between sites, making each unique. The practice has many elements which must be taken into account together for best success. As well as improving the landscape and helping wildlife, the methods provide many benefits to farmers: the trees provide shelter from the elements to livestock; there is no loss of grazing land at any time during the establishment of the trees; no change in land-use, with the areas remaining agricultural rather than becoming forestry; gorse and bracken are diminished as the trees develop a canopy, allowing more grass to grow between and under the trees; wood pasture is created. Sabre tree planting, along with the other no fence planting methods, provides a remarkable opportunity for establishing more woodlands in sheep grazed landscapes with the right topography. Fortunately sabre tree planting is recognised by Welsh Government and available as an option under their Glastir Advanced scheme. It is highly suited to Snowdonia where much of the landscape is steep. 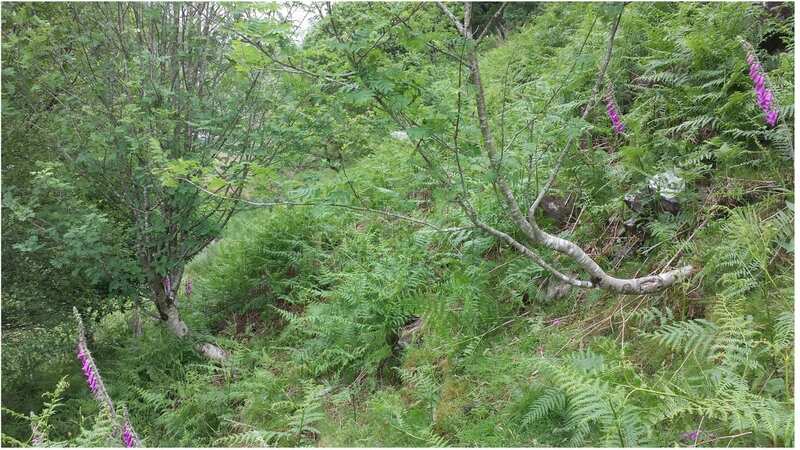 In the Cambrian Mountains, the hills are generally more gentle, but there are still plenty of micro sites in the landscape where trees can be planted. We intend to establish some trees for Cambrian Wildwood using this method. A nursery is growing some trees from seed collected at Bwlch Corog. Next year we will put on some planting days and get Steve along to train us in these no fence planting methods. A very Happy New Year To you Simon and All of your colleagues in the Cambrian Wildwood Scheme!!! Congratulations on yet another hope and inspirational article. This time on “Sabre Tree” planting and featuring a true unsung conservation hero of out fractious and trouble dominated era. Nearly four years ago, we watched from our Observatory below, on the Dovey salt marsh, as ‘ Steve Trees’ [ Steve Watson ]; your good self and others; built the Osprey nest subsequently occupied by Blue 24 and her sad attempts to raise her broods on that site. North Wales. He has created a wildlife corridor for us, with a mixture of trees planted across over half a mile of the saltings. it is proving its worth already! flanks of the Dovey area: Congratulations to all again: Keep in touch!!!!! Great to hear from you, Jim. I agree that Steve merits far more acknowledgement. If I was the queen, I would give him a knighthood. Good news about your plans for more osprey nests. I think Steve is doing a fantastic job, I build and erect nest boxes but on a much smaller scale in and around Blackwood South Wales, I wonder has he any plans to erect Osprey boxes in and around the Brecon Beacons I think there is suitable habitat, they are seen regularly in the summer months and autumn at Llandegfedd Reservoir near Pontypool would be great for them to colonise this part of Wales. Carry on the great work Steve. Thanks for your responses Gents: A Knighthood is long overdue for Steve, though I doubt if his politics would be much in favour of such an honour? Robert, I shall pass on your recommendations to Steve Trees at the first opportunity. His osprey Platforms with hand built timbered nests are second to none. I am actively trying to return OSPREYs, as breeding pairs to my old family area of the Towy and Taff estuaries. “Bridging ” contacts have been agreed and local landowners are slowly but showing increasing interest in my proposals.They hold key areas. I agree with you; there are so many reservoirs in your area; not forgetting LLangorse lake as potential sites for the future! Thanks for your interesting article. Inspiring . My wife and I have a 9-acre smallholding in Ceredigion straddling the River Arth. We have begun the process of transforming our grazing land into a natural habitat by planting a 100 large native trees this winter. But we are novices at this stage and would love to speak or meet Steve if that were at all possible. Please pass on our details and do let us know if there are any events Coetir Anian along these lines. We would love to help because we think the project is simply brilliant.